I know. I haven't written a book review in a while. 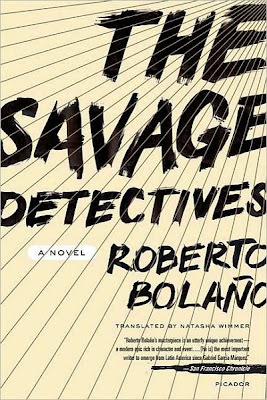 But that's because I was deeply engrossed in this magnum opus, Roberto Bolaño's The Savage Detectives. This book has been sitting on my bookshelf for a while now, as I bought it in a bookstore in New York City back in early March. I've only had a chance to read it now. And after a month, I came out of it feeling like my mind was blown away. So what is this novel about? This postmodern novel is about the search of a female poet, Cesarea Tinajero, by two other poets, the Chilean Arturo Belano and the Mexican Ulises Lima. The novel is divided into three sections. The first section is subtitled "Mexicans Lost in Mexico" and is a diary narrated by a young Mexican poet, Juan Garcia Madero. He writes in his diary the various events that surround him, as he stumble upon a group of poets in Mexico City who call themselves the visceral realists. There are two main entities in this group, Belano and Lima. Garcia Madero also talks about his sexual experiences with the Font sisters, and we see this section as a narrative about a young Mexican poet's coming of age. The very long second section is subtitled "The Savage Detectives" and is a series of interviews of many people (at least 40) that spans about 20 years, from the 70s to the 90s. Every interview is began by a boldface sentence detailing who the interviewee was, and where and when the interview was held. We never know who the interviewer was, however. In every interview, the reader learns of the activities of Arturo Belano and Ulises Lima, from the eyes of these interviewees. It almost feels like the reader is some investigative reporter, interviewing these "witnesses" who have seen Belano and Lima at some point in time. The short third section is subtitled "The Deserts of Sonora" and is again a series of diary entries of Juan Garcia Madero. The first section of the whole novel ended on New Year's Eve, while the third section begins on New Year's Day. It picks up where the first section has ended, and now we see Belano and Lima, as well as Garcia Madero and a girl called Lupe, trying to escape a pimp and a corrupt Mexican police officer by going to Santa Teresa, a border town in the Mexican state of Sonora. After spending a month reading this, I was just immensely amazed. Wow. Roberto Bolaño is such a great writer that I wished his liver (or was it some other organ) didn't fail, and that he's still alive to write more. But, it is what it is. I first encountered his works when I was in New York City in 2010 and stumbled upon his novel 2666, which turned out to be his final work, published posthumously. I read it, and enjoyed it immensely as well (for my review, click here). Aside from 2666, I also picked up his short story collection entitled The Insufferable Gaucho, which I wasn't too enthusiastic about (for my review, click here). I figured I prefer his novels better. So I gave him another chance and picked up this book. And again, I was amazed. I liked the fact that the whole book feels like a detective experience. It makes me think who really are the savage detectives, is it Belano and Lima as they try to find Cesarea Tinajero? Or is it the reader of this book, as the reader tries to learn more about Belano and Lima by reading someone's diary and interviewing more than 40 people? I liked that thought. I also liked the non-linear format of the book. As every detective who is trying to solve a crime knows, one encounters pieces of evidence not in a linear fashion. It presents itself as it goes, so one has to take the initiative and piece things together in a coherent fashion. Hence, in getting to know more about Belano and Lima, the reader has to take the initiative and piece things together on his own, to make the whole story coherent. This book gains a lot of plus points for me, due to the fact that it actively engages the reader into the story, instead of spoon-feeding it. This novel doesn't think its reader is an idiot. So idiots, beware, don't read this book. I like the parallelism it has with 2666. There are several references to 2666 in the book. Cesarea Tinajero mentions something about a year 2600-something where it would be the end of all things. Also, both The Savage Detectives and 2666 end in the city of Santa Teresa, which is a fictional version of Ciudad Juarez. Finally, given the fact that I see parallels in both books, as well as the fact that I have seen the film adaptation of the other recently, I cannot help but compare The Savage Detectives to Jack Kerouac's On The Road (for my review, click here). Both books are fictionalized autobiograpical accounts of the writer's own life: Sal Paradise and Dean Moriarty as a stand-in for Jack Kerouac and Neal Cassady; and Arturo Belano and Ulises Lima as a stand-in for Roberto Bolaño and Mario Santiago Papasquiaro. Both books chronicled the travels of both pairs. However, this is where the similarities end. I find myself preferring The Savage Detectives way more than On The Road. Bolaño was able to make his story post-modern and profound, and actually engaging. Kerouac on the other hand simply wrote a diary of hedonism. I could see the time and effort that Bolaño poured into creating The Savage Detectives, while I can only see Kerouac scribbling away his thoughts on to little sheets of paper while on the road, and just typing it away later. I have to say, I am willing to consider On The Road as simply a travelogue, but The Savage Detectives is a literary masterpiece. So there, I was quite impressed by this book, and thus I am glad that I picked a Bolaño book again. I definitely recommend this to people who are intelligent enough and willing to put some time and effort in understanding a complex narrative such as this one. If you're one of those people who just want to sit back and relax and want the book to do all the work, then this book is not for you. This is some awesome book that I whole-heartedly recommend. 5 out of 5 stars.